Posted on May 31, 2014	by Rev. Rosemary Hyde, Ph.D.
Today, we decided to just accept the timetable that seems to be working for us – leaving the house around 3 pm and doing the things that appeal to us, through the evening, getting home by around 11 pm or so. 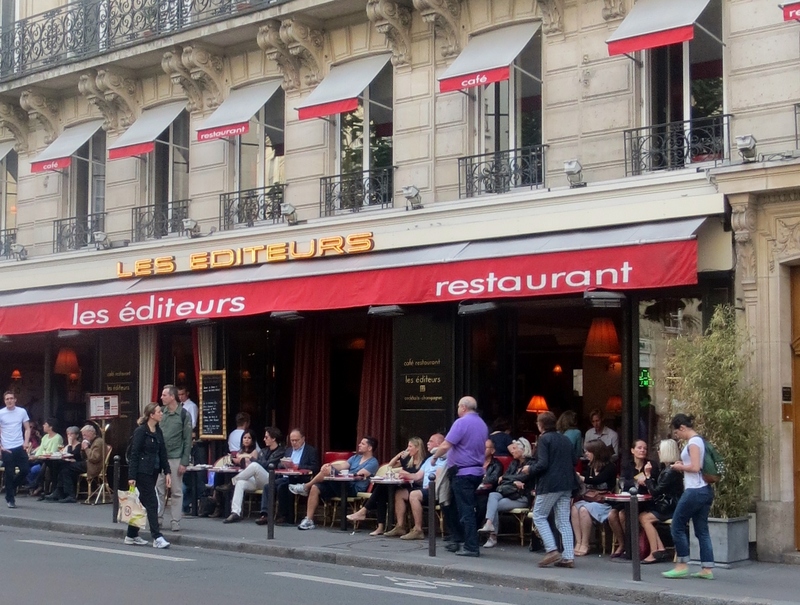 The day started earlier though, with Nancy going out to get her fresh croissant from the bakery down the street, and coming back not only with her breakfast, but with a bag of delicious Paris macaroons for me. She put the bag at my place, and said she was joining Marie Antoinette in proclaiming if I can’t eat bread, let me eat cake (referring to the distinct inconvenience in France of my gluten intolerance that rules out bread in the country where bread is the focal point of every day). 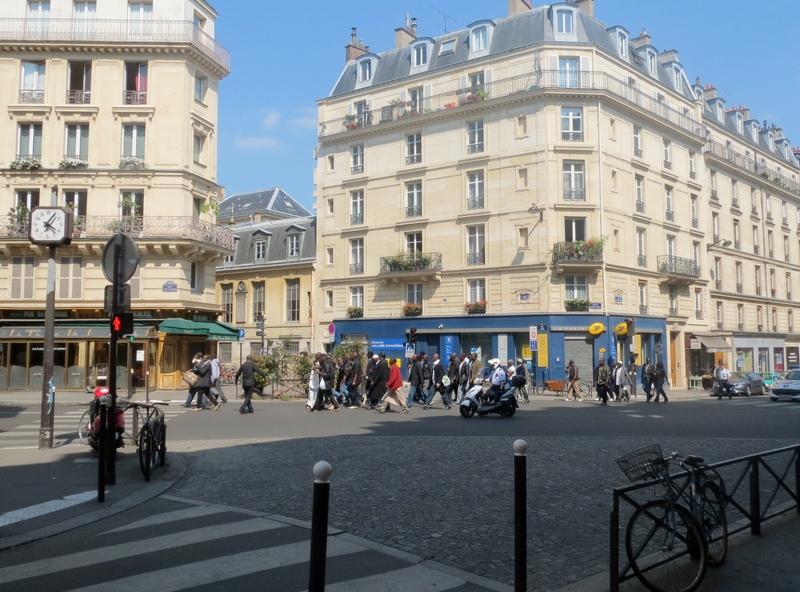 Around the corner from our apartment, going to the bus stop. 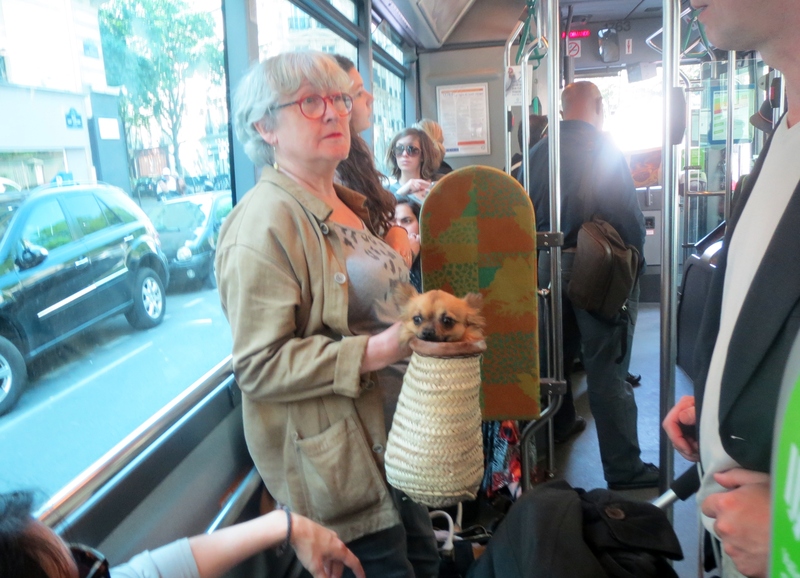 On the bus to Luxembourg Garden. Every single ice cream shop has a line outside it. 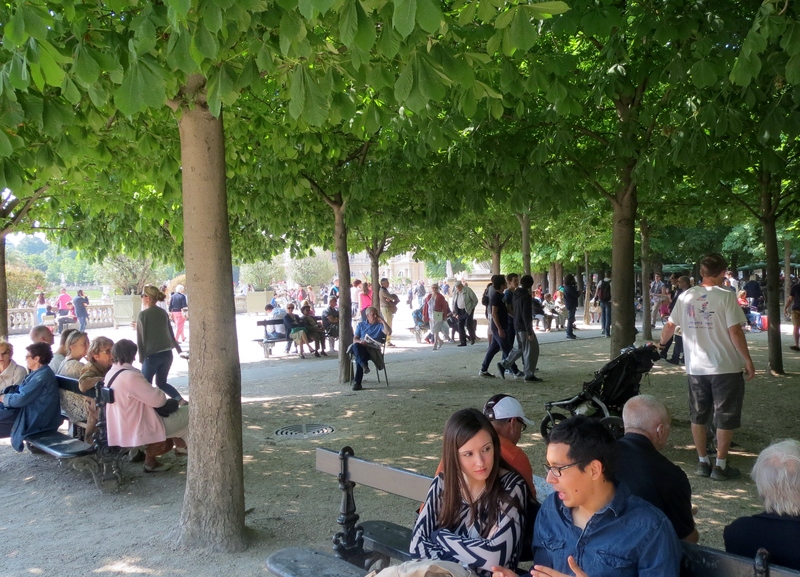 Paris is a very densely peopled experience! 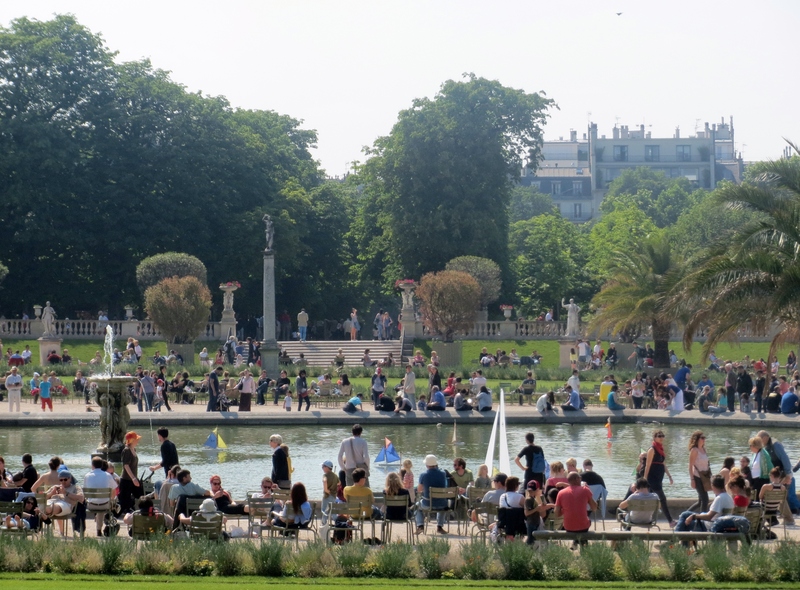 The “grand bassin” in the garden, with the traditional sailboats belonging to various children. 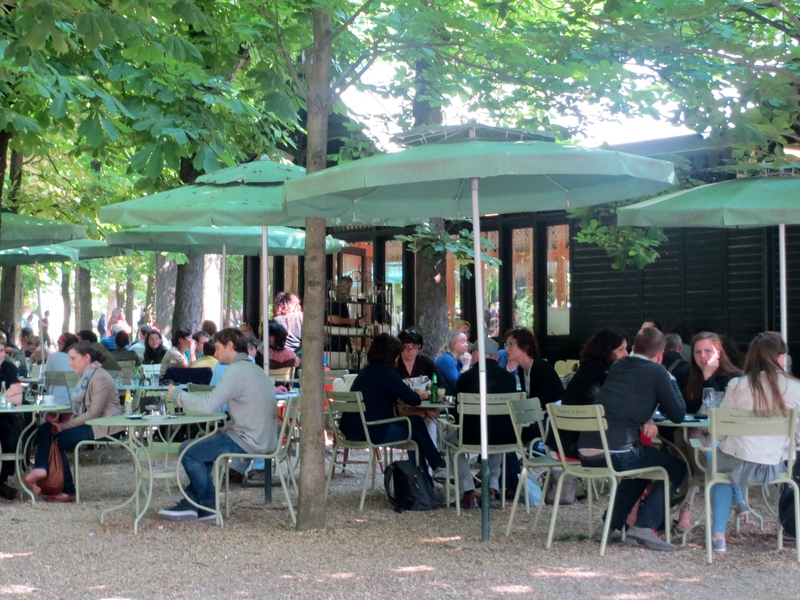 Cafes in parks are very popular on warm, sunny days. 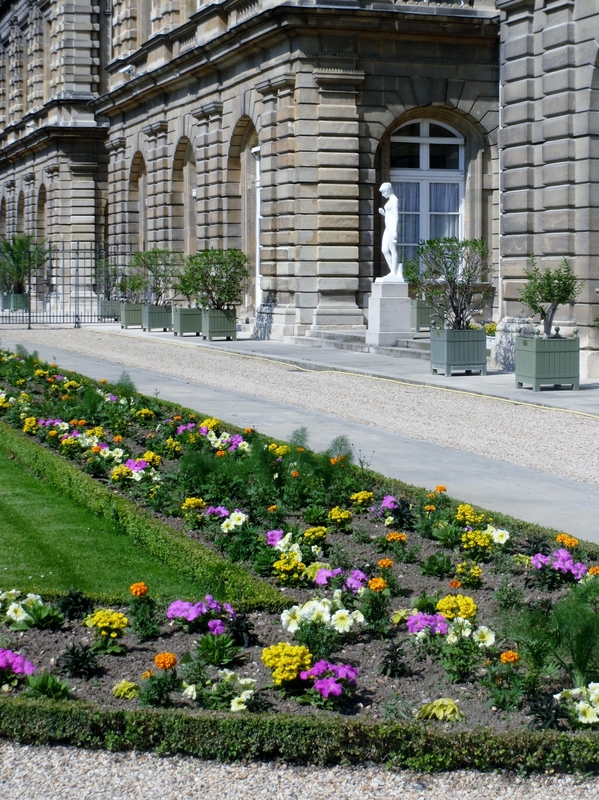 The flowers are stunning as a part of the whole composition of gardens and palaces. 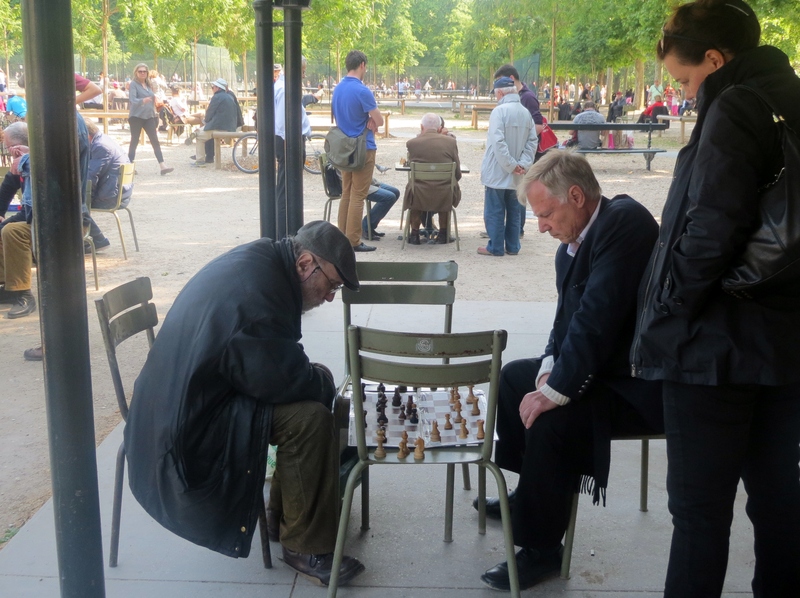 Many people were playing chess at tables and on chairs in one section of the park. 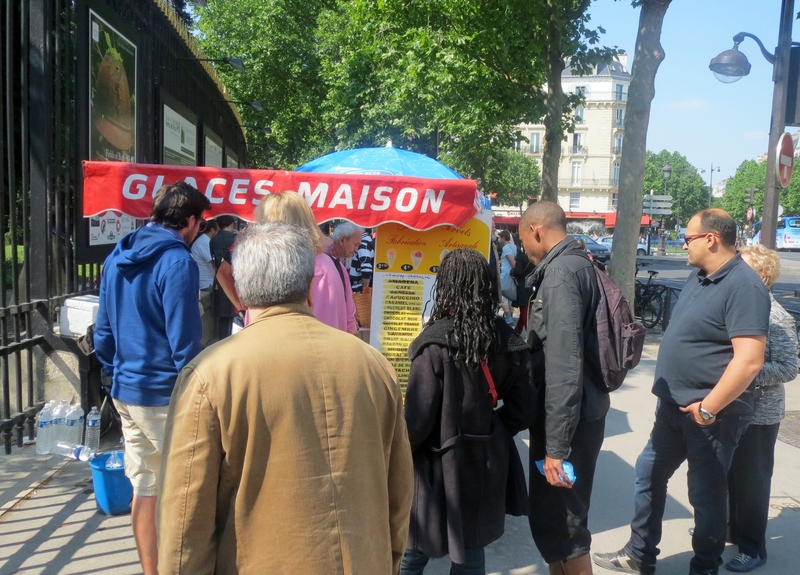 Younger Parisians had their own amusements. The park is enormous. This is one of the signposts for pedestrians. The pavilion was the site of chess playing. 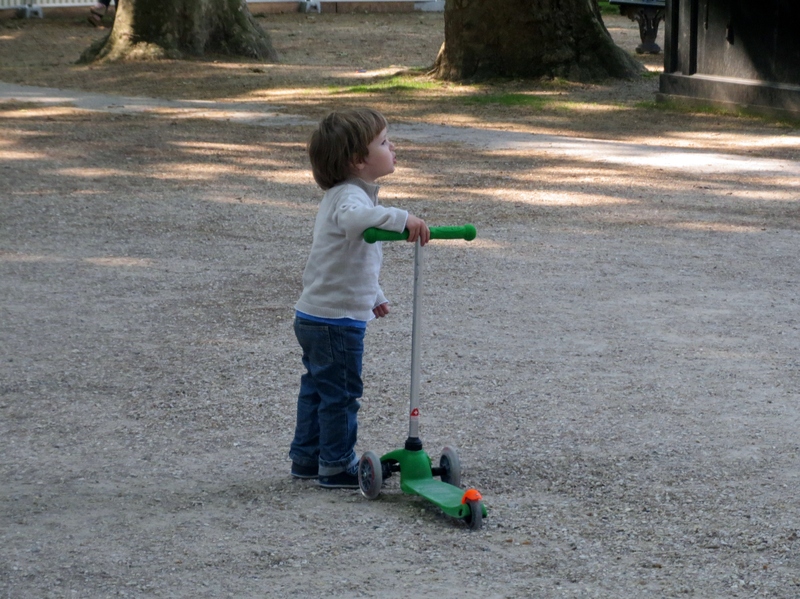 The jeux-attractions included a large complex of sandboxes and a small carousel for children. 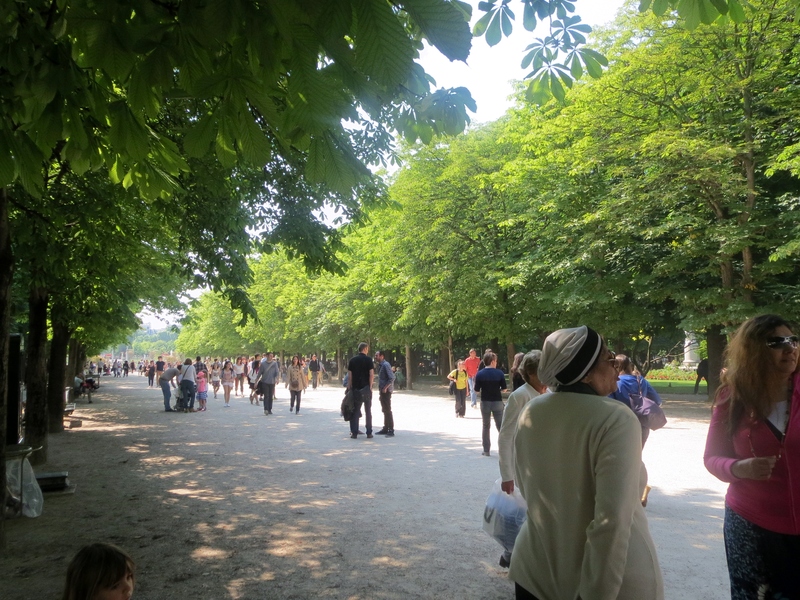 The verger and rucher — vineyard and beehives — were, I guess, for those who wished to imagine themselves far out in the country in this Parisian garden. 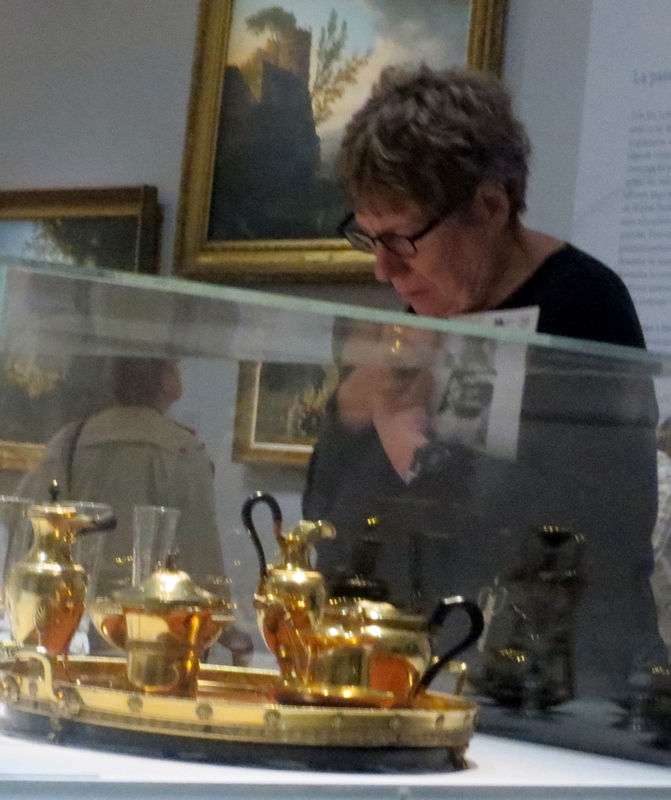 Nancy inside the museum admiring some of the golden tea service that had belonged to Josephine Bonaparte. 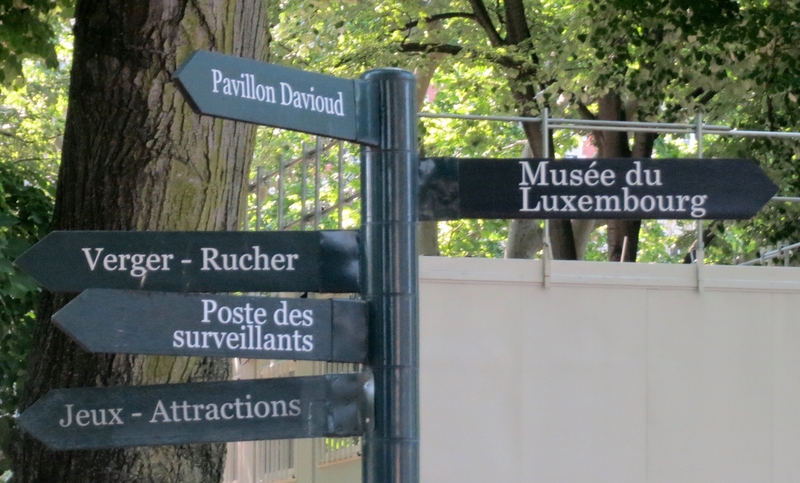 We had decided to enjoy the Luxembourg Garden and visit the Luxembourg Museum with its special exhibit marking the 200th anniversary of the death of Josephine Bonaparte in 1814. I had known that Josephine was the wife of Napoleon. But I had never learned much about her – she existed only in his shadow in my mind. I found it fascinating to learn a bit about her in her own right. 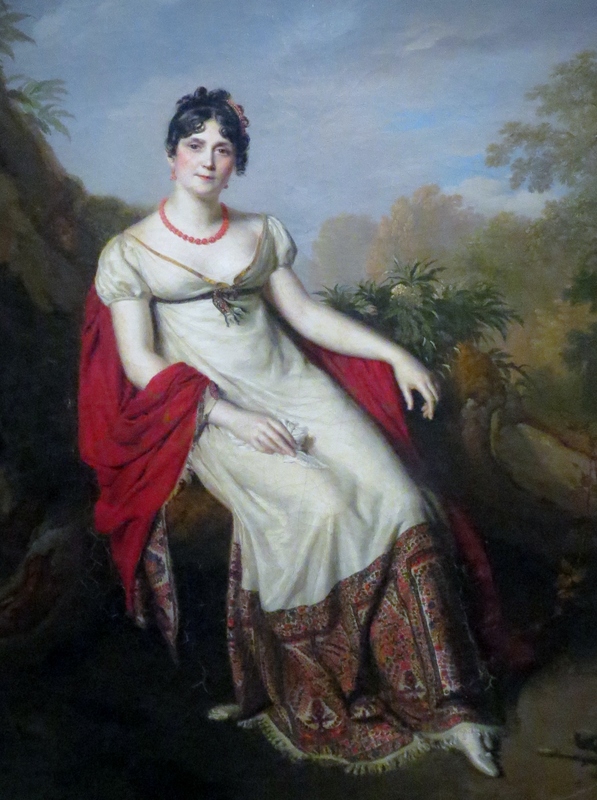 Like Napoleon, Josephine had been from the margins of French moneyed society – he from the island of Corsica, in the Mediterranean – French territory but Italian ethnicity, and she from a sugar plantation on the French Caribbean island of Martinique. Like Napoleon, Josephine had been a shrewd and successful promoter of her own success, both in marrying into wealth and power twice (Napolen was her second husband, after her first was executed at the Guillotine during the French Revolution), and in maintaining herself between marriages in the center of noble society of her time. Although they were married for only five years, Napoleon and Josephine were truly in love with each other, from the time they met until their deaths several years after he had their marriage annulled so that he could marry a younger woman with the hope of fathering a male heir. In addition, after returning to single life after her marriage with Napoleon, she successfully mentored her two children by her first marriage so that they and their children married well into royal and powerful families, so that her descendants found themselves in the palaces of several European countries, and she kept a good relationship with both her children and her grandchildren. And she advanced the cause of science by fostering exploration of the first deliberate hybridizing of roses, resulting in roses becoming popular garden plants. Napoleon had given her the name “Josephine.” Her birth name was Marie Rose, and her family of origin knew her as “Rose.” She loved roses because they invoked her beloved name. The exhibit did an excellent job of portraying Josephine and her life through artifacts, paintings, and clothing. It was organized chronologically, from her girlhood in Martinique through her first marriage to a Parisian military man of noble parentage, her widowhood and imprisonment during the French revolution, her early days with Napoleon, leading up to her coronation by him as Empress of France and Italy. It then followed through in depicting her years as Empress, and finally, her years in her own home of Malmaison outside Paris, again single, till she died of pneumonia in 1814. 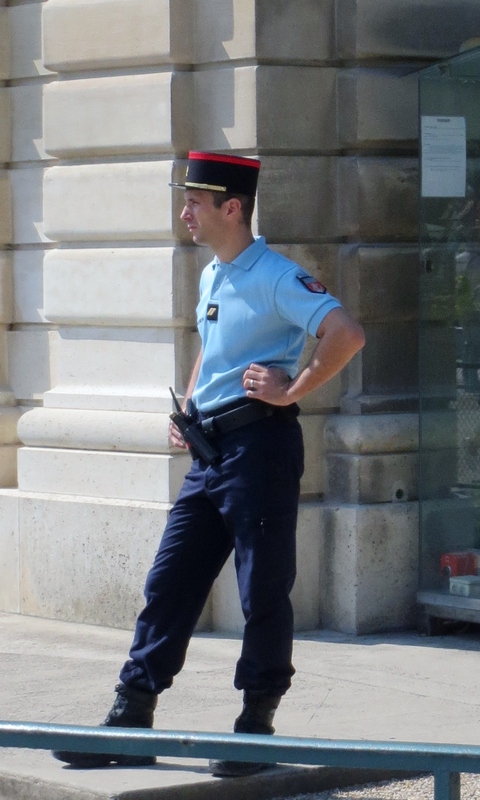 In contrast to the earlier French queens, she was generally regarded with appreciation. People found her kind and gentle, in addition to enjoying her lively beauty. Josephine in her later years. We enjoyed a wonderful surprise during our visit to the exhibit – an hour long informal chamber concert that lasted close to an hour. 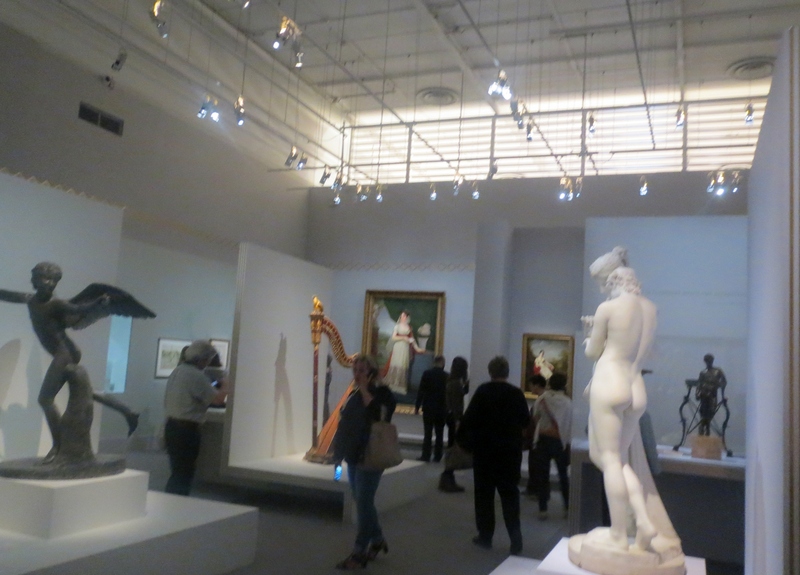 The 6 musicians – flautists, violinists, a cellist, and a harpist – strolled through the exhibit and played from different locations. It was a quite delightful accompaniment to the elegant and rarefied atmosphere of the exhibit itself. 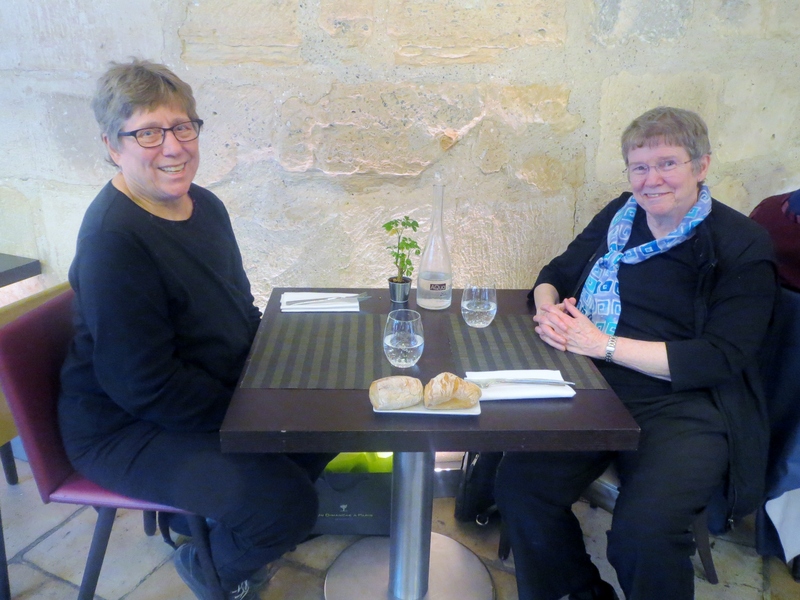 Before coming to France, Nancy had offered to take me out to a wonderful French restaurant as a delayed Christmas gift. We had decided that today would be the day. We made a reservation for 7 pm at a restaurant that Nancy had noted before we left Durham. 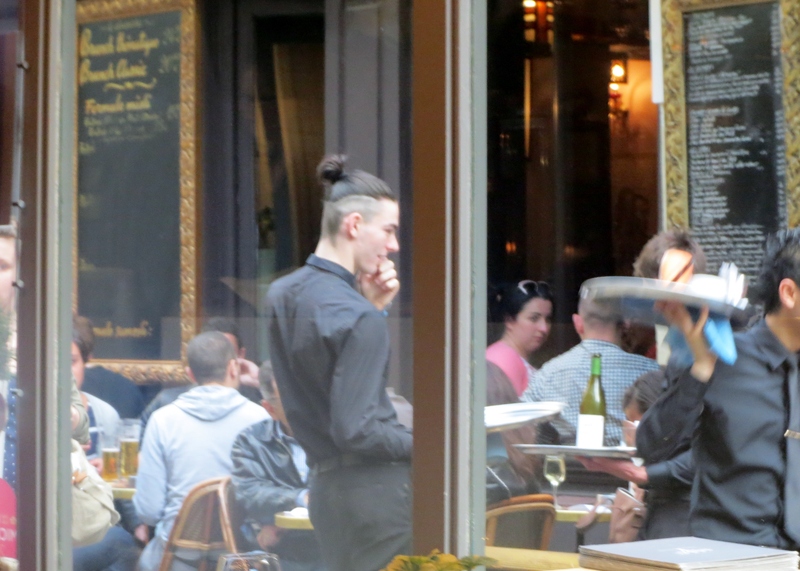 The restaurant is called “Un dimanche a Paris.” It was located quite magically in a medieval alleyway accessed through an arched gate in the façade of a 19th century building along the bustling Boulevard St. Germain. 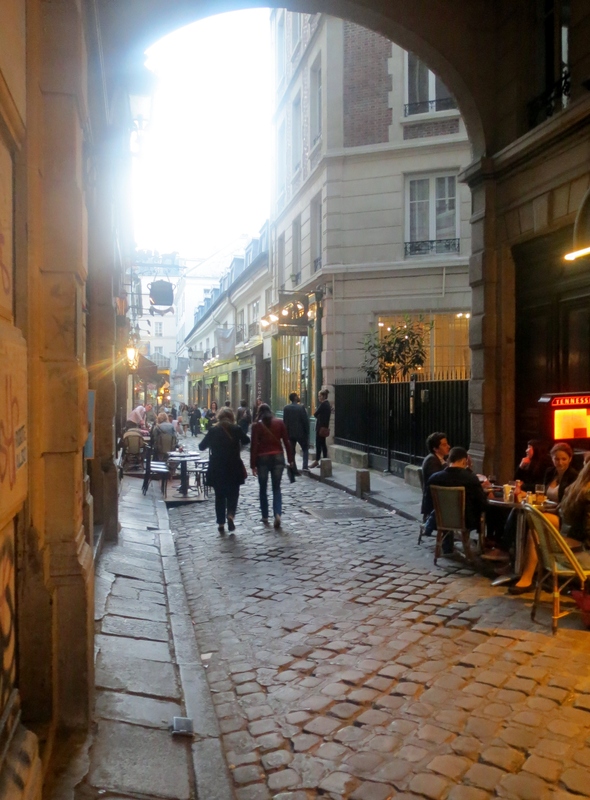 The alleyway was called Cours du Commerce St. Andre. It reminded me strongly of the passage in the first Harry Potter book when Hagrid took Harry shopping for his Hogwarts supplies, and they somehow magically passed from a bustling London street into an alleyway of medieval shops. It was that sudden and amazing. The alleyway was narrow enough to support the illusion that two people standing together in the middle could stretch out their arms and simultaneously touch the buildings on both sides. One feature of the alleyway was the continued existence of a round stone tower from the 1200s that had been part of the walled fortifications of Philippe Auguste (the walls that protected Paris through most of the Middle Ages). 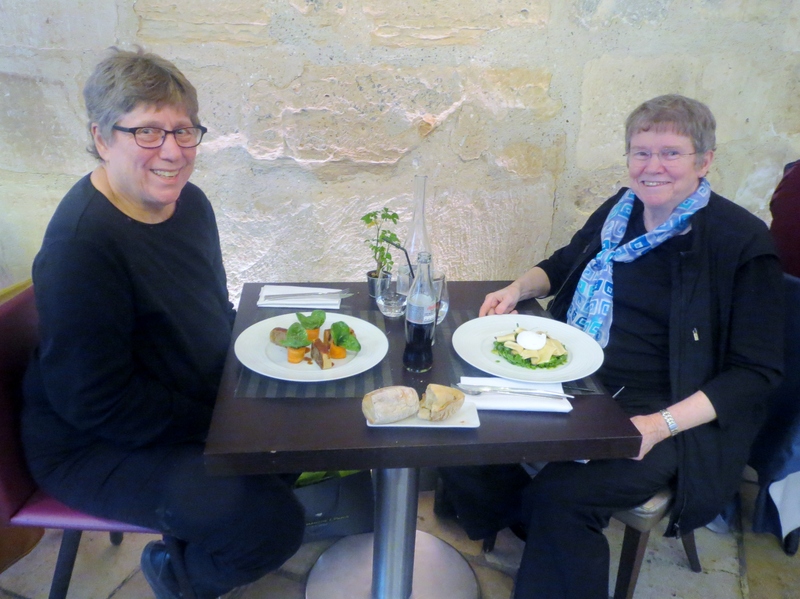 The tower wasn’t visible from the alleyway, but when we entered the restaurant, we were ushered to a table situated at its base. The restaurant’s building had been built around the medieval tower! Dinner was a three course marvel. 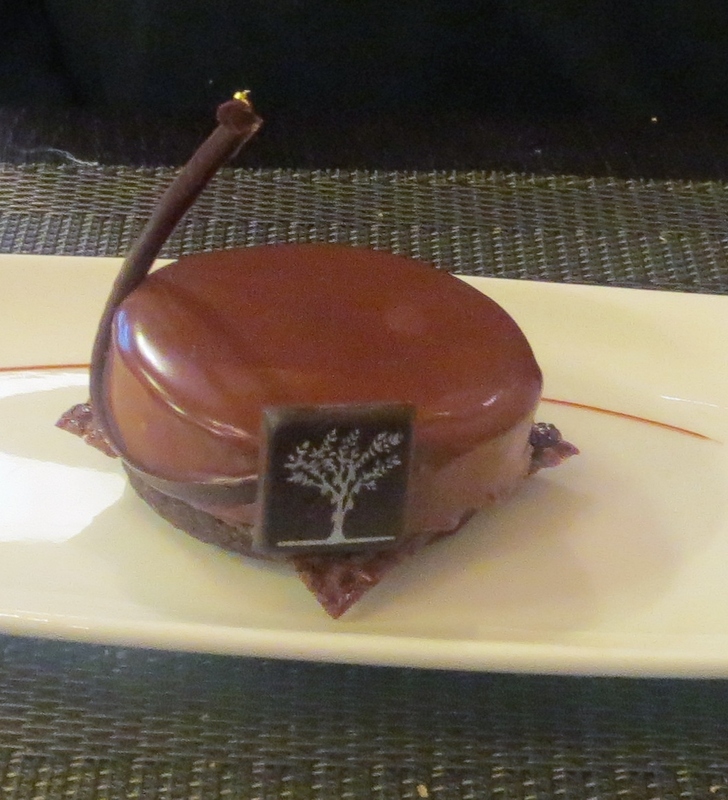 The restaurant’s specialty is the use of chocolate in many recipes. 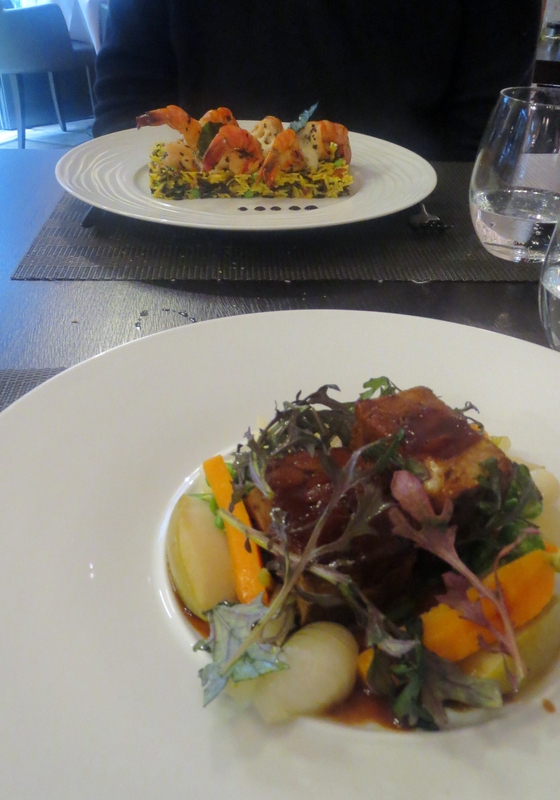 So we had mushrooms with a very subtle chocolate sauce, and lamb shoulder and a kind of Paella with chocolate sauce. The chocolate touches in these dishes were not at all obtrusive. 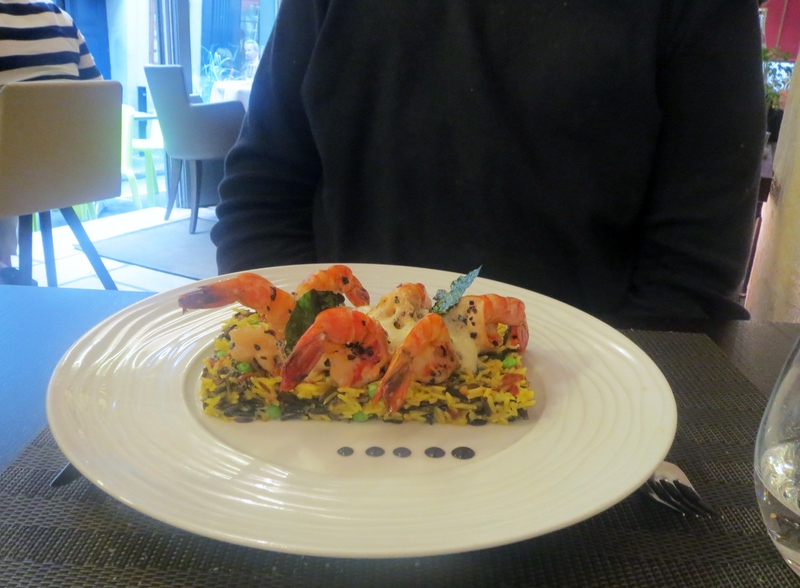 They simply added depth and richness to the palette of flavors. Nancy’s dessert was totally chocolate. 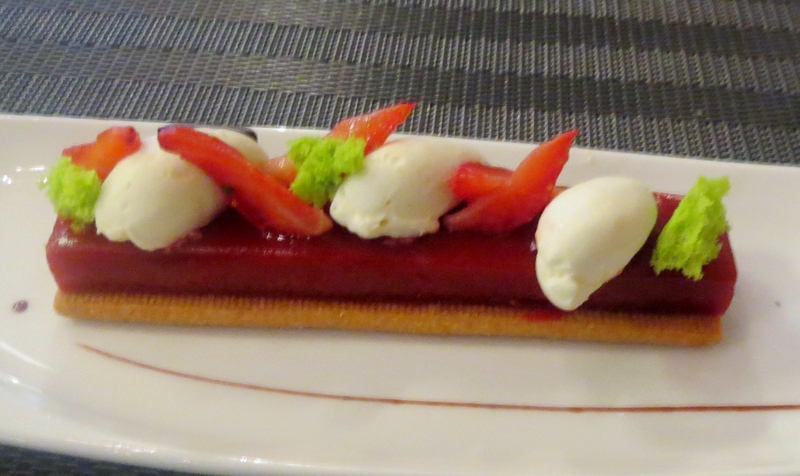 Mine was a gluten free (a real rarity in Paris) strawberry tart garnished with squares of dark chocolate – Yummy! It was a wonderful ending to a very enjoyable day, for sure. 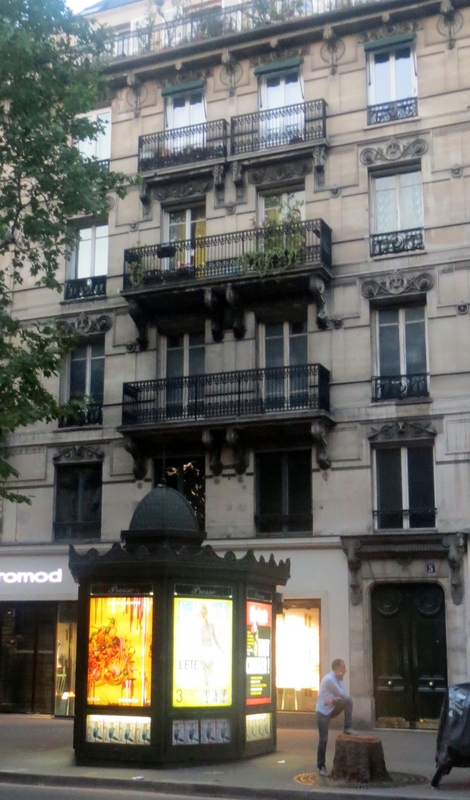 Back on the boulevards, waiting for the bus to take us home — a typical 19th century Paris apartment house. 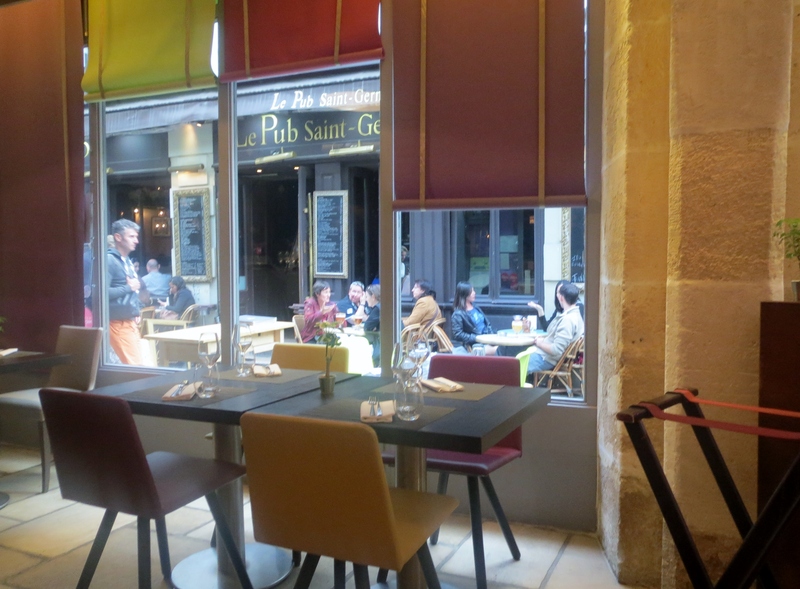 This entry was posted in Uncategorized and tagged a perfect day, Cour du Commerce St. Andre, Paris, restaurant, restaurant Un Dimanche a Paris, St. Germain. Bookmark the permalink.